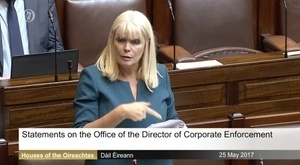 TDs made statements on the Office of the Director of Corporate Enforcement, received by Fine Gael’s Minister for Jobs, Enterprise and Innovation Mary Mitchell O’Connor. 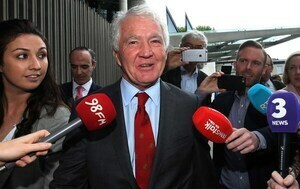 It followed the acquittal of former chairman of Anglo Irish Bank Sean Fitzpatrick earlier this week, after lead investigator from the ODCE shredded documents which were relevant to the investigation. “The first thing I think we need to say, in relation to this debate, is that Ireland doesn’t do prosecution of white collar crime and it’s not just this collapse of this trial or the acquittal of Seanie Fitzpatrick, but it’s, for decades now, we’ve seen that thread. “We’ve seen the underfunding of resources, of agencies that are supposed to be tackling white collar crime, we see staff resources being cut and we see our legislative framework, that should underpin a strong, robust anti-corruption and white collar crime agenda, simply not there. “My colleague spoke about the request, when the ODCE was established in 2001, and it was established as a result of the tribunals of investigation, the massive corruption that we’ve seen in those tribunals, tribunals that span three decades, yet only one conviction because of corruption. “Despite the fact that we know that politicians were up to their neck in it, in relation to brown envelopes. Despite the fact that we know that people had benefitted, in terms of their own lifestyle as a result of backhanders given to people in influential places but CAB didn’t go in and seize the assets at that time, because there’s one rule for certain individuals and another rule for others. “But when it was established in 2001, within a number of years, the director was requesting resources. The director wrote to Micheál Martin, who was the line minister at that time in 2005, and continued to write to him over a period of time, telling him that the Office of the Director of Corporate Enforcement was wholly inadequately resourced. “Minister Martin at the time refused the request and at a time when tens of thousands of additional public sector workers were bing recruited, not an additional staff member was given to the Office of Director of Corporate Enforcement. 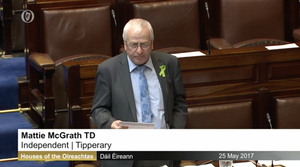 “Bertie Ahern, sitting for years where you’re sitting today, and said that they needed to wait their turn. And, at the same time, at the same time, Seanie Fitzpatrick and his ilk were setting in train the economic disaster that people the length and breath of this country had to endure over the last ten years. And that is a symbol of how this country deals with white collar crime. 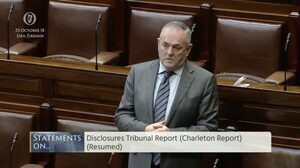 “This is the Seanie Fitzpatrick that we’re told now, by the Fianna Fail deputies, that should be behind bars and caused absolutely catastrophe but, a number of years ago, is the same Seanie Fitzpatrick that their party was appointing to different boards in this state. The same Seanie Fitzpatrick that their leader was out playing golf with, taking advice in terms of the economics of the country and sipping wine and sharing dinner. 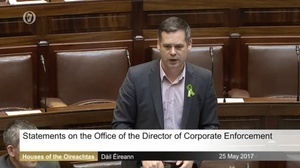 “So what I am really annoyed about today is that all we’re going to do is go through the motions, we have the fake outrage from Fianna Fail in relation to white collar crime, despite the fact that they refused to, refused to beef up this agency at a time when it needed beefing up. 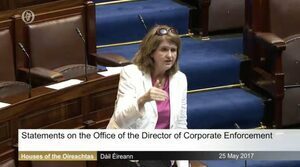 “We have your own fake outrage, despite the fact that we see the ODCE, over the term of the Fine Gael government, since 2011, drop 25% of its staff. “There was no need to wait ’til this trial collapsed, there was no need to wait to beef up the resources in relation to the ODCE or to have a review, not just in that agency, but every single other agency. That is what happens in modern democracies, that is what happens when people in suits take your economy and ruin your country. “You look to start to see well, what are the agencies we have, let’s do a review, let’s see if they’re fit for purpose, and let’s strengthen them up, let’s beef up our legislation. But that’s not what happen and you stand there and you say ‘we presented seven additional forensic accountants to the ODCE’. “Yes they’re there at the end, but the request came in at 2013, they weren’t appointed until 2015. Two years, this trial was ongoing at that time. We only had one person who could actually forensically analyse data on a computer. It is absolutely mind-boggling. It is something you would see in Monty Python, that this is how the State deals with white collar crime. “I stood there, year after year, challenging both the minister, with direct responsibility, and the Taoiseach, to have a complete review in relation to white collar crime agencies in this State, an agency that would, a commission that would look at all of our agencies to make sure they’re robust enough. But, crucially, as well, to overhaul our legislation to make sure that we’re not going after the minutiae of it when these bankers, when these people who wrecked our country should be rightly behind prison. “But we, because we have not made it illegal, for what they have done, they are walking the streets of Dublin, and elsewhere, with smiles on their faces able to get on with their lives. While the tens of thousands of people, who’ve been forced to emigrate, or are in poverty, or have lost their houses, are suffering because of their misery. 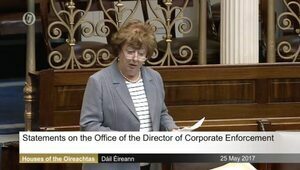 “…I had experiences of dealing with the Office of Director of Corporate Enforcement around the time I was dealing with the issues in relation to Siteserv. And my contacts were in relation to, for example, where there was definitely evidence of a spike in shares of a company that was, was not, was heavily indebted. “And, essentially, my contacts were, there was letters back and forth and I was told it wasn’t their role and ‘we don’t hold that information’ and, really, if insider trading is not about corporate responsibility, I don’t understand what is. “We looked to bring a solution to the table in 2015, when the Social Democrats first called for an independent anti-corruption agency. 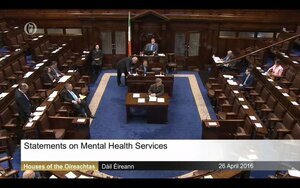 Some of these agencies work in other countries, we looked at examples of how they worked in other countries and we brought to the Dáil back in December 2015. At the time, it was voted down by Fine Gael and Labour. “We persisted with calls to, having undertaken extensive work on what such an agency would look like, how it would operate and examples of such practice internationally and they informed our research. “…If we look for an example, and the issue of Templemore and the gardai, the Garda staff that were assigned, it says in the report, the Garda staff that were assigned to administrative roles in the college had no training or experience of administration, had no knowledge of public or financial procedures. That is the Garda College that trains our guards. Is it any wonder that we don’t take white collar crime seriously. It’s not taken seriously at every level. What it requires is political will to do something about it. And to do something fundamental about it and not put this off into the future. Former Tánaiste, Labour TD Joan Burton raised Fine Gael Minister for Protection Leo Varadkar’s Welfare Cheats Cheat Us All campaign. 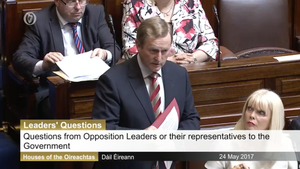 “I’ve seen those ads on the buses by my successor in Social Protection [Leo Varadkar] against social welfare fraud. You’re [Mary Mitchell O’Connor] listed as one of his supporters in the current discussions around your party. Posted in Misc and tagged Anglo Irish Bank, Dail, ODCE, Sean Fitzpatrick, statements at 4:50 pm on May 25, 2017 by Broadsheet. Anything I say now would have them knocking on my door at 5am.. These people have some nerve all the same.